I've read a number of books about Test-Driven Development. There are a number of new ones, but most of them start with a clean slate where you're writing code from scratch. 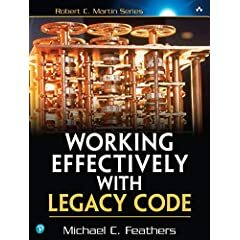 Working Effectively with Legacy Code is different. It starts with the assumption that you already have a codebase that doesn't have tests and need to figure out how to start adding tests as you work on the existing codebase. And each chapter has a detailed discussion of the problem, the strategy or strategies you might use, and the tradeoffs involved. That last point is pretty important - the Agile community has more than its share of zealots, so there's a lot of dogmatic advice out there. This book is the opposite - the author has clearly spent a ton of time applying his techniques to real codebases, and there are lots of interesting discussions out there. Even if you aren't sold on the whole Test-Driven approach, there's a lot of content that will apply to general refactoring. This is one of the best books I've read in the last few years. Highly recommended. I was looking for something on this topic. I have an application framework I wrote last year but, although I looked into NUnit, I procrastinated doing the Test code so now I have a large solution with 47+ projects and I really need to implement TDD with my team. This looks like just the book to to get me started. So I ordered it today along with "Build your own .NET Language and Compiler"